Magnificent is an adjective more than earned by mint. It’s magnificent for so many reasons. First up is its hardy, easy-going habit. Some might say too easy-going given its reputation as a bit of a gangster in the border – but more on that later. Second is the diversity of flavours and textures offered by the many varieties of mint. As a result, there’s its multitude of culinary uses, from pesto to tea, ice cream to salads. Got a recipe idea in mind? There’s a mint for that! I love mint in all its guises. Brewing up a refreshing mint tea is probably my go-to use for it, closely followed by an equally quenching mojito or two! It combines well with other herbs too. Try adding a chiffonade (the cheffy term for slicing into fine ribbons) of mint and basil to a garden-grown salad of leaves for the gastronomic equivalent of the exclamation mark: fresh, zingy and tasty for sure. With so many types to choose from you’re bound to have your preferred mints. Barbara Pleasant recommends three must-grows for drinking, eating and as reward for the hardest working gardeners of them all – the bees. 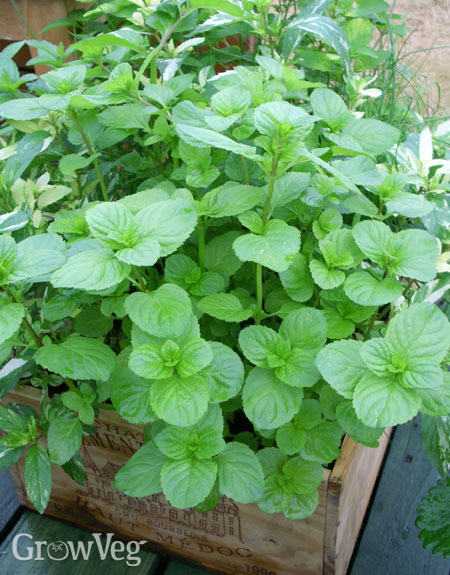 Certainly peppermint, apple mint and spearmint are deserved of any garden. But if you fancy expanding your collection further, add these beauties – though please don’t stop there! 1. Pineapple mint: This variegated mint, with its white-rimmed leaves, is a real eye-catcher. It has a citrusy, pineapple scent that works well in drinks or fruit salads. 2. Chocolate mint: This type of peppermint is the perfect dessert mint. It’s sweet to taste, with only the gentlest of tingles, making it good as a simple garnish or the main event in a minty ice cream or mousse. It doesn’t half look good either, contrasting dark stems with bright-green leaves (see the photo at top). 3. Orange mint: Orange mint has a strong, floral nose. Try planting it along a path where regular foot traffic will waft its heady aroma to permeate the air. 4. Grapefruit mint: This is another citrusy choice that’s loved by wildlife and good for cut flowers. 5. Ginger mint: The pretty, stripy leaves have a (you guessed it!) ginger-mint fragrance. It’s a good all-purpose mint, particularly lending itself to homemade lemonade or a wake-you-up tea. To get the most from mint, grow it somewhere that gets lots of sunshine. Mint is very forgiving however. It copes with shade, though its flavour won’t be quite as intense, and while it enjoys moist soil it will bounce back after a period of dry weather. Its rambunctious reputation is no doubt down to the searching stolons and tenacious roots typical of some mints. It causes many gardeners to view mint with something bordering on paranoia! I’ve had first-hand experience of bringing an unruly creep of mint under control, but persistent digging out (and lots of mint tea) eventually tamed the bully. If you’re planting mint for the first time and are a little anxious, don’t be. You have a few options: grow it in a container, or plant an open bottomed container into the ground and plant into that instead – the walls of the container will stop or at least slow down the stolons in their tracks. A third option is to grow mint somewhere where it will be regularly mowed or trampled back – against a paved or gravel path, or the edge of a lawn, for example. But if you can’t get enough of mint or have a gardening friend who would love to share some of your collection (or vice versa! ), it’s worth knowing that mint is one of the easiest herbs to propagate by taking cuttings. Late spring to early summer is the best time of year to take them, from soft new growth of non-flowering stems. Use a clean, sharp knife or secateurs to cut just below a leaf joint, then trim off the lowest leaves. Cuttings should be somewhere between 7-10cm (3-4in) long. Insert them into a cuttings mix, or make your own by thoroughly combining equal parts compost or a general-purpose potting mix with sharp sand. Cuttings should be inserted to just below the remaining leaves then ideally covered with a clear plastic bag or propagator lid to raise humidity around the cuttings and speed rooting time. Once you see fresh growth, it’s likely the plants have successfully rooted. Carefully tease the cuttings apart and pot them on into individual pots. Mint is also a great candidate for rooting in water. Prepare the cuttings as above and pot on once you can see the first new roots. 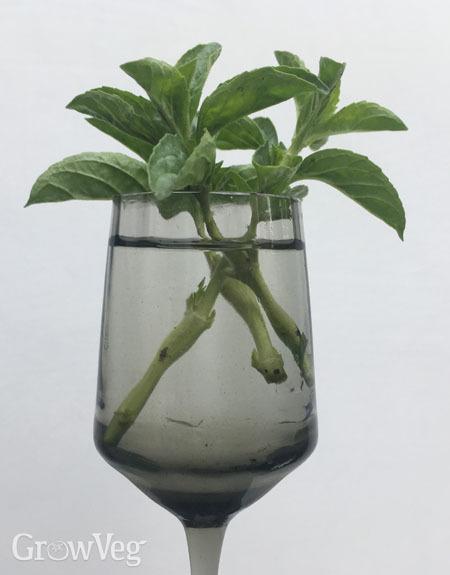 While you’re waiting for the roots to emerge, change the water regularly so it doesn’t become a breeding ground for bacteria that will turn your cuttings into a foul-smelling sludge. Choose, plant and propagate galore. With so many flavours and textures to try, you’re truly spoilt for choice with mint!